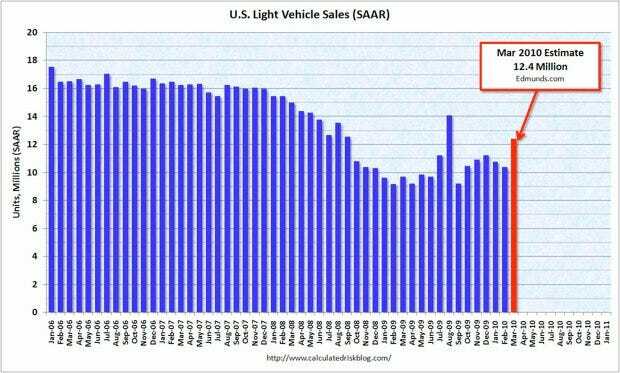 March was the highest month of sales for autos in the US thanks to various incentive programs put forth by the manufacturers and dealers. According to Edmunds.com, excluding August 2009’s Cash For Clunkers program, March 2010 had the highest sales rate since September of 2008. The reason behind the surge in auto sales Incentives dished out by dealers to play off Toyota’s recalls and negative publicity. As Toyota became villified by the American media for its shoddy vehicles, other automakers (with the exception of Chrysler), saw a significant boost in sales. 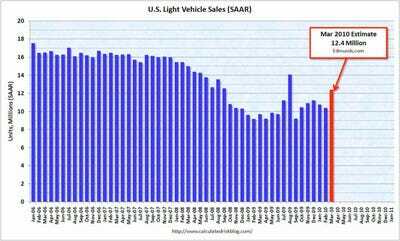 Edmunds: Edmunds.com analysts predict that March’s Seasonally Adjusted Annualized Rate (SAAR) will be 12.4 million, up cfrom 10.3 million in February 2010. Below, a chart from Calculated Risk breaking past sales down.